I know, I know. Sugar. But I've been doing much better with it since my last post. I don't even feel like I NEED to eat dessert every day of the week, which is huge progress. Today's recipe is one created in celebration. I made them as a treat for a race well run. Bonus: They're wheat-free, gluten-free, peanut-free, and vegan. BAM! Preheat your oven to 350 degrees F. Line a baking sheet with parchment or lightly grease and set aside. When you've finished processing all your dry ingredients into meal, put the almond meal, processed oats, oats, cocoa powder, salt, and baking soda in a large bowl and whisk until well incorporated. Set aside. In the bowl of an electric mixer fitted with the paddle attachment, combine the sugar, maple syrup, flax eggs (see above), oil, and almond extract. Beat until fluffy-ish. Then add the dry ingredients to the wet and mix well. 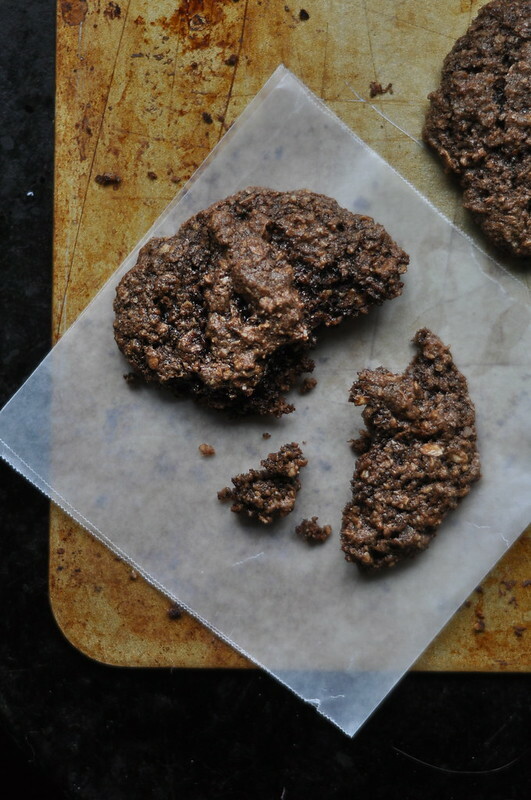 Scoop heaping tablespoonfuls onto your cookie sheet. Bake for 10 to 12 minutes. 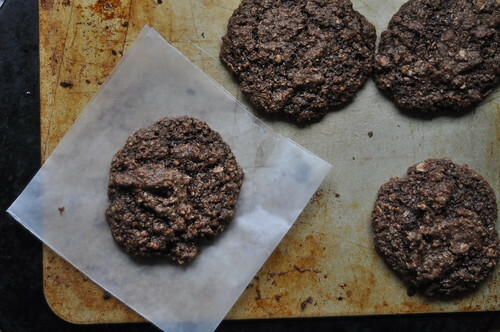 Recipe yields one sheet of generously sized cookies that keep well in an airtight container for a week. While these guys were baking, I took a peek in the oven and was amazed at how well they were turning out. 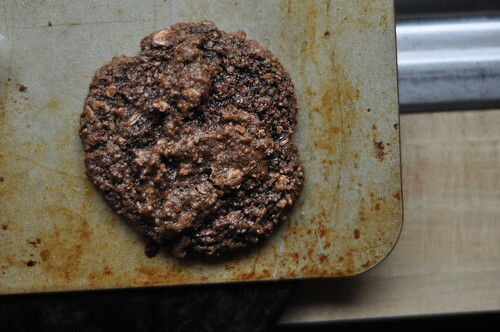 It's been a while since I created a cookie recipe entirely from scratch (and not just a variation of an old favorite). They are chewy, chocolatey, and completely satisfying. If you're in the mood for something fruity, check out today's recipe post on Writing Chapter Three. 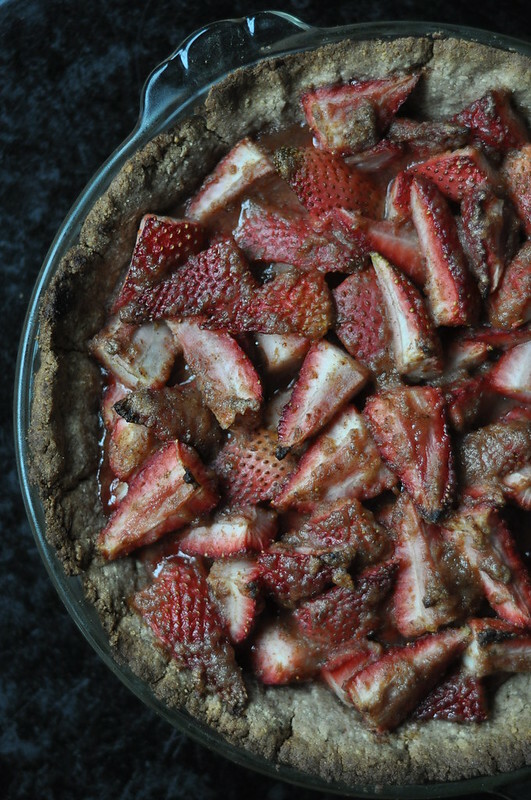 Strawberry pie with a rye-almond crust. One of my proudest baking creations in a long, long time. I definitely need to make more pies -- stat!